There is definitely an art to writing a shelf talker. How do you distill everything you love about a book into a few short sentences? Because that is one of the key points of a great shelf talker – it must be SHORT. 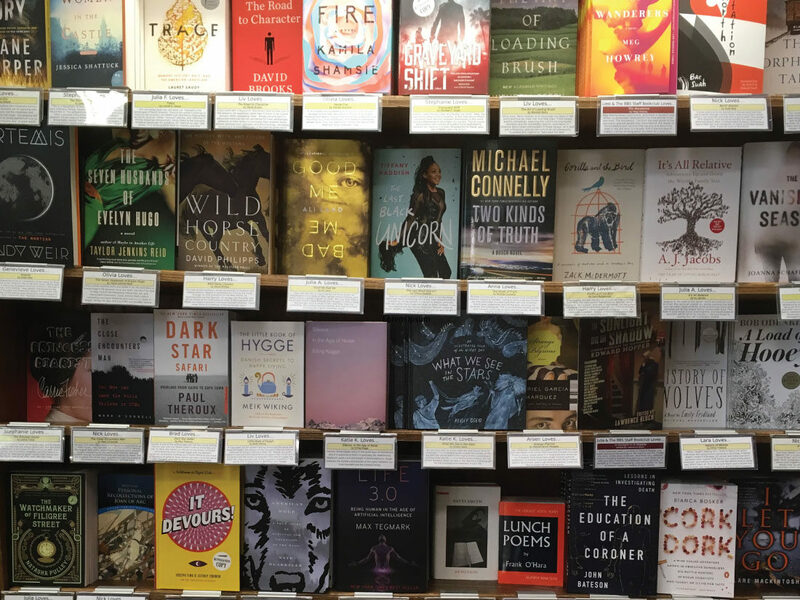 I tell our booksellers that their recommendations should be between 50 and 75 words, partly because that’s how many words we can fit on our tags, but mostly because a customer is not going to stand in an aisle of the bookstore and read a five paragraph essay about a book while they decide whether or not they want to read it. 1) Talk as briefly as possible about the plot. You want to give the person reading the shelf talker an idea of what kind of book it is – memoir, fantasy, science expose, romance – but you don’t want the whole shelf talker to be a regurgitation of the plot. That’s what the back of the book is for. 2) Before you begin writing the shelf talker, think about what it was about this book that made you want to write a shelf talker in the first place. Did it have a unique and gripping story? Were the characters well-rounded and all-too-real? Was the writing so beautiful you had to stop reading every now and then to just marvel at a sentence? 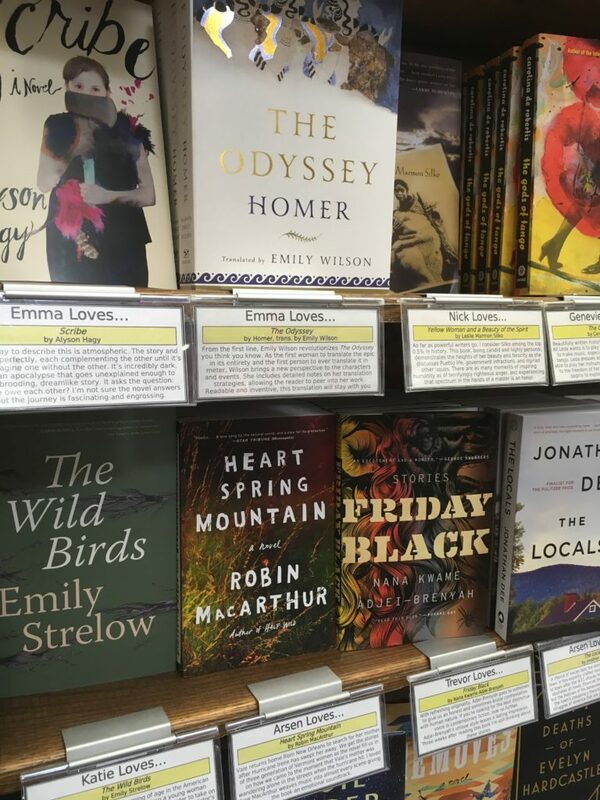 The best shelf talkers always include something personal from the bookseller – it lets your customers know that this is a real person writing a real review for a book they really loved (not someone just trying to market to them). 3) Who would you recommend this book to? Is this a book every cat-lover should read, or wine connoisseurs would particularly enjoy? Or perhaps this is the book for someone who loves hard-hitting journalism? And I know you see this on the marketing copy from publishers all the time, but suggesting this book because you loved another is something that people pay attention to (especially if it’s coming from a real person, not just an algorithm or the publisher’s marketing). 4) Try to avoid writing shelf talkers for books that are already bestsellers on the national scene or are well-known classics. 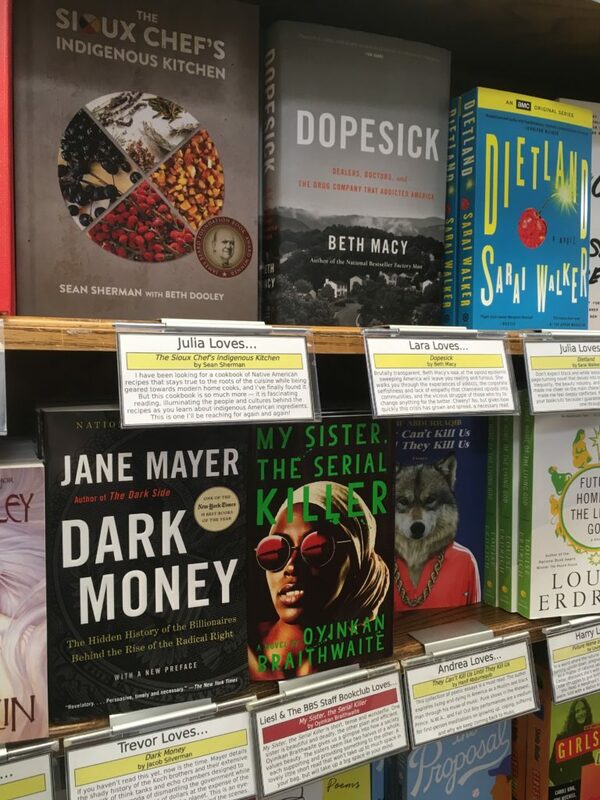 In our store, we see our recommendation section as an opportunity to introduce our customers to books they might not have found otherwise. And while Stephen King/Neil Gaiman/JK Rowling/Jane Austen/Charles Dickens are great, they don’t really need our help to sell their books. 5) Don’t be discouraged if it feels like it’s taking you forever to write something! It can take time to write a great shelf talker – I’ve spent days mulling over what I wanted to say about a book before being able to finish a review. If you get stuck, write a list of all of the things you want to say about the book, let it sit for a day or two, and then come back and decide which things are most important. 6) The first sentence is the most important, so work the hardest on that hook. A customer might only read the first sentence before moving along, so it’s key to grab their attention right away. 7) While you’re writing, pretend that you’re handselling to help the tone of your writing feel conversational. Actually talking to someone about why you love a book can also help you figure out how to write about it. After a mysterious pocket watch seems to save him from an explosion at Scotland Yard, Thaniel tracks down its maker in search for answers. But the mysteries only deepen when he befriends the mysterious Keita Mori. Questions of fate and free will challenge your preconceptions in this genre-bending historical mystery that blends a complex and charming plot with just a little bit of magic. If you enjoyed de Rosnay’s Sarah’s Key or Hannah’s The Nightingale, here’s a book you’ll like. Sebba explores the plight of French women during the Nazi Occupation. Women across the spectrum of Parisan society — women who collaborated, resisted, or just kept their heads down trying to survive. And it’s all the more riveting because these women actually existed. This book is much needed in a market filled with amateurish, poorly researched speculative nonsense by happy-go-lucky stoners. If you like cited studies, objective descriptions of genetic processes and their interactions with the chemicals involved in marijuana, and the cool eye of a neuroscientist who does not appear to be a hippie lobbyist, this book is for you. The best resource available for real facts on the subject. Refuge is a lyrical, memorable, and meaningful story about what happens to a family when some escape and some remain behind. It is a stunning portrait of what it means to be a refugee, what it means to be an immigrant, what it means to feel displaced, lost, and in between two worlds. This is a remarkable book, perfect for fans of multi-generational family dramas. What lengths would you go to, to save your country? To avenge your massacred people? Rin, a shaman with the destructive powers of the Phoenix god, deals with these moral quandaries and worse in this grimdark military fantasy based on the Second Sino-Japanese War. If you liked A Game of Thrones, and wished The Name of the Wind was darker, this is your book. Stephanie Schindhelm is the Marketing and Promotions Manager at Boulder Book Store in Boulder, Colorado. She has served on the MPIBA Board of Directors since 2017.